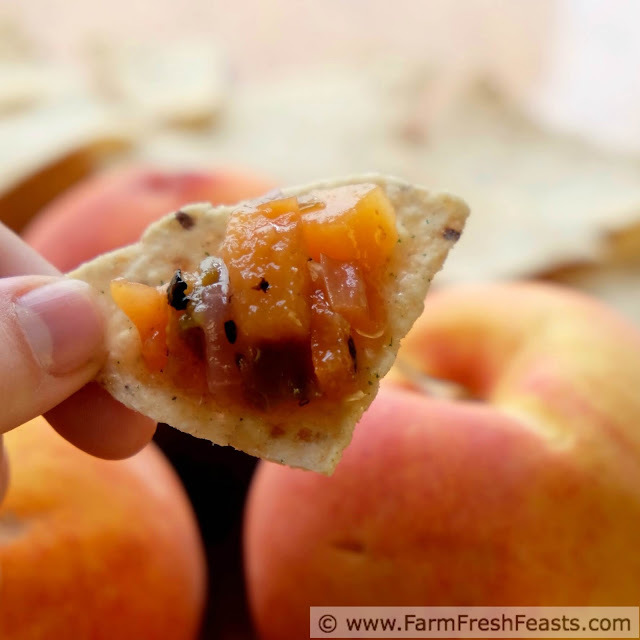 This thick blush-colored salsa is sweetly fruity from the peaches and plums, with a nice level of heat from the roasted chiles. It clings to the chip so you get all of the flavor while dipping. Most Saturdays in summer, I walk a dog or three down to the farmer's market to by fresh produce. 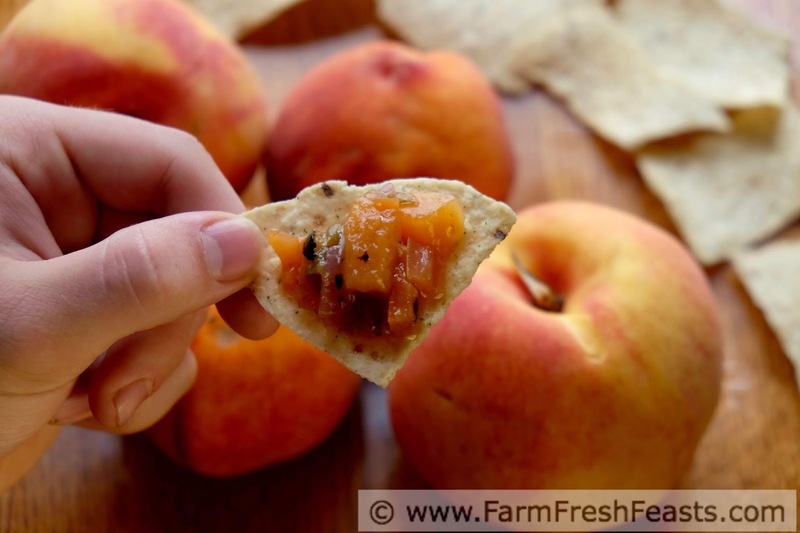 Like a Summer Tomato Sandwich, fresh ripe peaches in summer are one of those tastes you just need to enjoy while you can because you cannot replicate the flavor with out of season produce other times of the year. So we gorge ourselves with fresh fruit, and I keep buying more because I know I've got to get it while the getting is good. 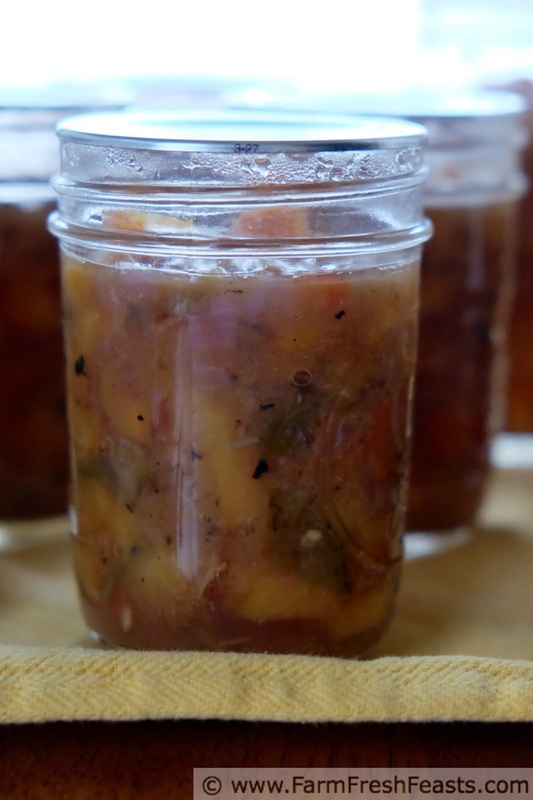 Last summer my friend Jen posted a photo of her canning efforts on FB, saying that her son polished off an entire jar of peach salsa in one sitting. Intrigued, I asked her for the recipe. She told me it's straight outta Food In Jars (Amazon affiliate link), Marisa McClellan's eponymous (ooh!) first book from her terrific blog. I knew from the start that I was going to change up the recipe because I've become smitten with the flavor of roasted Hatch chiles. Each August my local grocery store fires up a chile roaster in the parking lot (a round cage like contraption with a flame shooting into it) and I can walk a dog (or three) down to pick up a quart of freshly roasted chiles. [Like my local farmer's market, the grocery store provides water for dogs.] These roasted chiles freeze well, and I buy several quarts for a year's worth of roasted chile needs. If you don't have a local source of roasted Hatch chiles, roast the hot peppers you've got, or pick up a can of roasted green chiles at the grocery store in the Hispanic foods aisle. I was thinking about the color of the finished jars when I chose the orange-purple peppers at my Community Supported Agriculture (CSA) farm share pick up. The final piece for this recipe came when my favorite fruit vendor had yellow plums at the farmer's market. The plums were so ripe they weren't exactly the best looking fruit, and we had a conversation about how good looking produce has no correlation with good tasting produce. 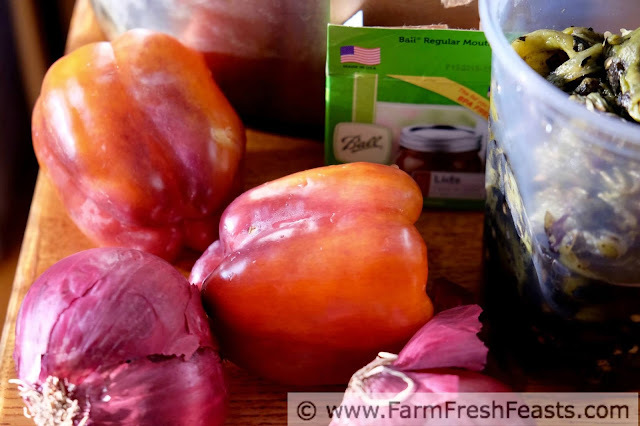 With the combination of ripe local peaches, plums, and orange-purple peppers, as well as roasted Hatch chiles, I was set to get my salsa on. This salsa is sweet, with heat, and thanks to the plums has a lovely thick consistency which clings to the chips. It's addictive. I was lucky to make a large batch and can it in small jars, and I've been sharing it around over the past year. While making arrangements to teach a canning class at my local community center I shared one of my last jars of this batch. I'll be teaching salsa making next month, but not peach salsa, though we'll sample from my final jar so folks know they can use the same technique to make a variety of canned salsas. For more recipes using Hatch chiles, please see my Hatch Chile Recipes Collection. For more recipes using peaches, please see my Peach Recipes Collection. For more recipes using plums, please see my Plum Recipes Collection. For more recipes using peppers, please see my Pepper Recipes Collection. These collections are part of the Visual Recipe Index by Ingredient, a resource for folks like me eating from the farm share, the farmer's market, the garden, the neighbor's garden, and great deals on ugly produce at the grocery store. Note: Hatch chiles are only available for a short time in August, but they freeze well. Feel free to substitute another roasted chile pepper. 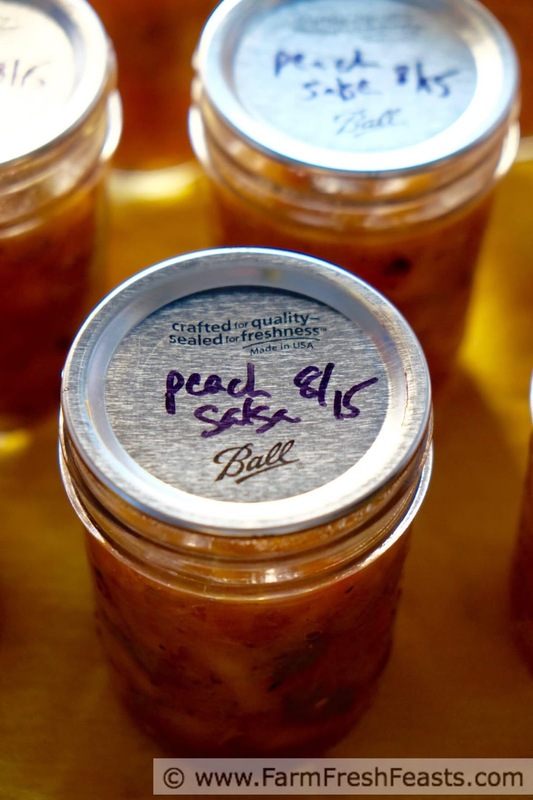 If you'd prefer not to use plums, please get a copy of Food in Jars and follow Marisa's Peach Salsa recipe. Another Note: Here's some sites with terrific tutorials to get you started on the nuts and bolts of canning: Food In Jars Canning 101 and Pick Your Own All About Canning are two good ones. If you're planning to boiling water bath process this salsa, bring a large lidded pot of water (with a rack or towel to keep the jars off the bottom) to a boil, and stick your washed & rinsed canning jars into it so they get warm and stay out of your way. Heat some water and stick your lids in to soften the seal if you like, though it's not necessary any more. If you're not planning to process this salsa, simply keep it refrigerated. I recommend using these reusable plastic storage caps (Amazon affiliate link) because they sure are easier to open/close/keep clean than a lid + ring. This can be refrigerated for a good 10 days or so. Once you've decided to process or not process, dump everything listed above into a pot. I use a 3 to 5 quart pot depending on what's available. Bring the contents to a boil over medium high heat, then turn the heat down and simmer for 20 to 30 minutes until the salsa has thickened a bit. 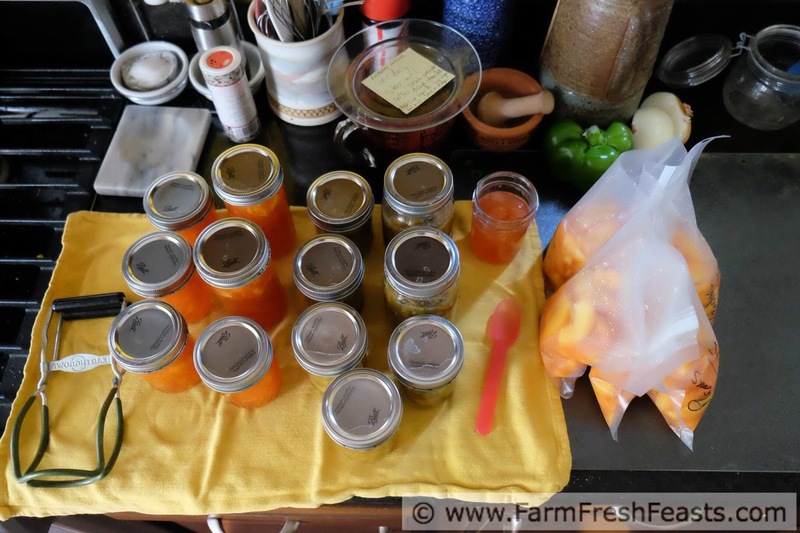 Place a kitchen towel on the counter top to put the jars on while you're working. If you're not processing this salsa--it's good to go! Let it cool down, and transfer to a container, then store in the refrigerator. If you're wanting a shelf stable salsa that you can dig into in the dead of winter [that'd be my motivation] ladle hot salsa into hot jars. Wipe the rims of the jars with a damp paper towel, then place a new lid and a ring onto each jar. Screw the ring on only until it's just tight. That's called fingertip tight. Don't crank on it. Place the filled jars into the prepared pot, making sure the water covers the top of the jars by 2 inches. Cover the pot and let it return to a boil over high heat. Once the water is boiling (I can tell because steam escapes from my lid) set the timer for 15 minutes. After the timer rings, turn off the heat and remove the lid from the pot. Wait a moment, then remove each jar to the towel-lined counter. Shortly you'll hear a Ping! as the escaping air forms a vacuum to seal the jar. It's beautiful music. I let my jars rest overnight or until they are completely cool. Then I unscrew the ring (and save it for the next canning project) and pick up each jar by the lid. If the jar is sealed properly, you can lift the jar with just the lid. If the lid comes off, the jar is not sealed. Store it in the fridge and use that one up within a week-10 days. Store the rest of the jars, without rings attached, in a cool dark place. Use them within a year or so, if they last that long. After I finished using the canner for the day (peach jam, peach salsa, and peaches to freeze) but before removing rings and labelling lids with what's inside. 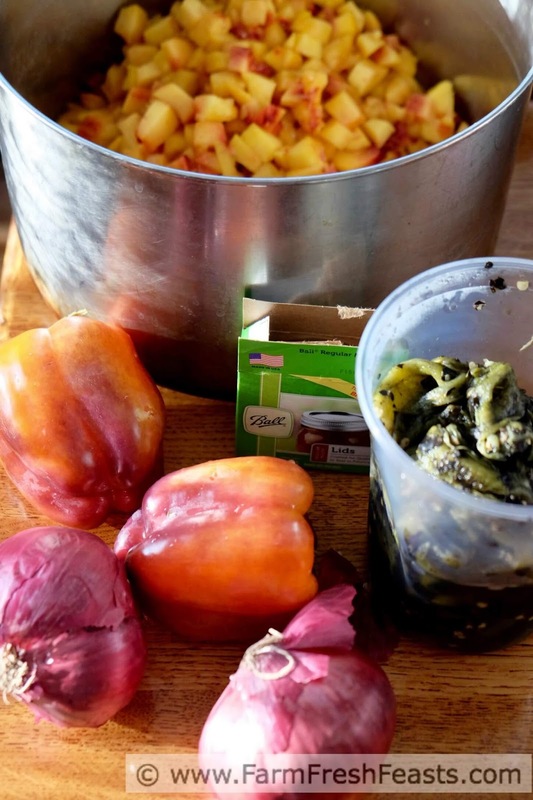 Your Peach Salsa recipe is definitely remarkable and will help a lot of mom's out there who ran out of new recipe to serve to their families. I am a collector of salsa recipe and is happy to came across your post, because the recipes I read from coolessay reviews are not very easy to follow and requires expensive ingredients. How interesting, to collect salsa recipes. Sounds like a spicy hobby! Have you read The Artist's Way? It's a great motivator.